The iconic New England city of Boston, Massachusetts, is 220 miles northeast of New York City. Boston has a population of nearly 650,000 and is one of the oldest cities in America. To get from New York City to Boston, there are several transportation options. Consider the pros and cons of each option to choose the best transportation option for you. Advanced booking of many of these options can offer additional savings. Boston played an important role in the American Revolution, which can be explored by walking the 2.5 mile Freedom Trail. A self-guided tour can cover many of the important landmarks. Other popular Boston attractions include Quincy Market, the Boston Museum of Science, and Fenway Park. A day trip to Boston from New York City can be ambitious since car travel can take up to five hours, but it is doable. To make travel worthwhile and to enable you to get a seafood-packed bite or a hint of the rich history in Boston, a night overnight might be a better idea. 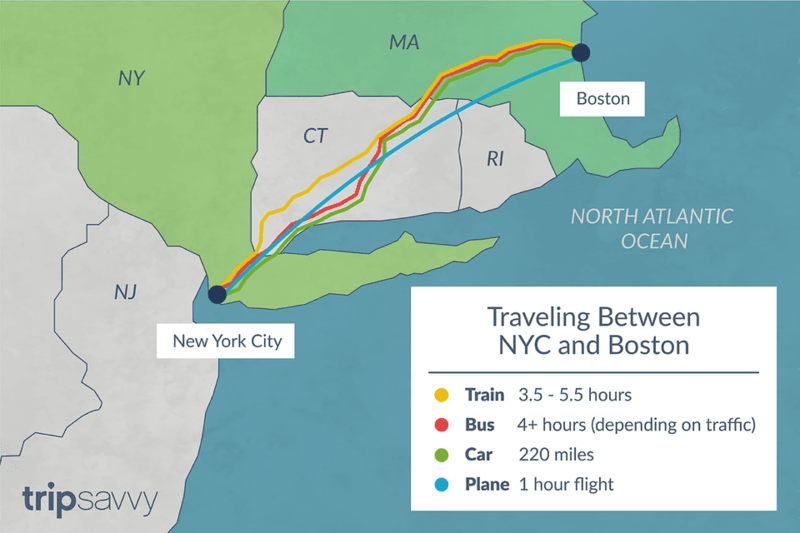 Traveling by train to and from Boston and New York City is a quick, low-stress option. Trains travel from Penn Station in Manhattan to Boston's South Station. The Amtrak Acela service takes three-and-a-half hours, while other trains can take as long as five-and-a-half hours. You can purchase tickets in advance by Amtrak or in person at Penn Station. The biggest advantage to traveling this way is that Amtrak is quick and direct, although Amtrak is pricey. The Acela can cost from $70 to $170, and the trains offer wifi service. Bus service to and from New York City and Boston is an easy, affordable option. Trips can take four hours and up, depending on the traffic. The Greyhound buses depart from Port Authority Bus Terminal, while other bus services, like the Bolt Bus and Mega Bus, depart curbside. Each bus company offers at least two dozen departures daily. A ticket per person can cost from $10 to $40 each way. You can drive to and from New York City and Boston—the most direct route takes you through Connecticut on I-84 to I-90 in Massachusetts and is about 220 miles. The drive passes through New Haven or Hartford, Connecticut, both of which can be troublesome during rush hour. For most visitors to the region, it does not make a lot of sense to rent a car since you might not need a car in either city and parking can be difficult and expensive. Plan on about five hours of travel time, though stops and traffic will add to the overall time. Visitors to New York City can rent cars in Manhattan, although rates at the airports tend to be cheaper, if less convenient. Flying to and from Boston is the fastest way to travel. The flight takes about an hour, but that does not include time spent getting to and from the airport, checking bags, or clearing security. That said, some shuttle flights to and from New York City and Boston can be cheaper than the train and run frequently. Boston Logan International Airport is the closest and most convenient airport to downtown Boston and the T train runs from the airport to downtown. Travel by plane can be an advantage because it is fast, and can be less expensive than the train. Often the biggest disadvantages are dealing with airport hassles and factoring in the time, energy, and cost of getting to and from the airport.